Since then a lot has happened and our church has continued to grow. There have been three major extensions to our facilities, in 1969, 1990 and 2013, as the church changed to meet the requirements of a growing community. New faces have come, ministers have been and gone, and services have been changed to meet changes in the wider world. Our church is a very different community now than it was in those early days. In 2013 there was a major redevelopment of the west side of the building with an expanded kitchen, changes to meet current standards, and a new meeting room and quiet room in an upstairs extension. This has allowed us to do even more work in the local community. 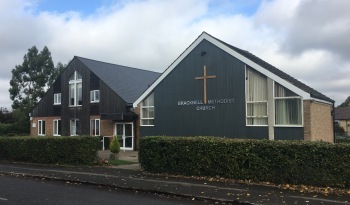 To find Bracknell Methodist Church take the Binfield Road B3018 from Bracknell town centre. Shortly past the Total garage turn right into Shepherds Lane at the crossroads. The church is located several hundred yards down on the left, just past the Prince of Wales public house. The car park is at the rear off Agar Crescent. Click here for a map. For information on room bookings and information for the weekly notice sheets please contact Mike Bush - 01344 640305 - . Details of our Safeguarding Policy can be seen here. Comments on the website and items for inclusion should be sent to Dave Sergeant - .